There are a limited number of slots for oral submissions still open (click here for list). Please Note: While every effort has been made to ensure the accuracy of this list, it is possible that it may be incomplete or contain errors. Starting 6 pm EDT on Friday, March 22nd, the Program Committee will be finalizing the oral schedule using the contributed oral abstracts received by that time. Abstracts submitted for consideration for the open oral slots will automatically be considered as potential poster contributions if no oral slot is available. Invited speakers who were not able to submit their abstract earlier, either in the system or via the Division Chair, are invited to submit their abstract by March 30, 2019. Post-deadline poster abstracts will be accepted until May 15, or until the available poster slots are filled. 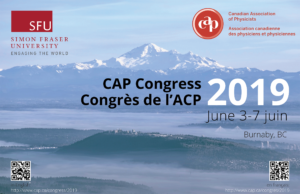 Click here for abstract submission instructions, as well as the link to the 2019 CAP Congress Abstract Management System. A block of rooms has been reserved at a number of hotels as well as on-campus, which will be released as early as April 17th. The Congress is being held at the outset of Vancouver’s high season, which means that accommodations will become more difficult to secure closer to Congress. We, therefore, encourage anyone planning on attending Congress to book a room now to ensure they have accommodation, and to make note of the hotel’s cancellation policy in case your plans change. Click here for more information on our block bookings.